We're happy to announce grass-fed beef Slider Saturdays at our Templeton tasting room, beginning January 13 from 12 noon to 3pm. Start your Martin Luther King weekend off with a tasting of our wines, accompanied by grilled sliders (3 for $10). We are partnering with our neighbor Nature's Touch to make food available in the tasting room. They will be cooking delicious grass-fed ground beef sliders from our Adelaida Springs Ranch, served open-faced on a sliced sourdough baguette topped with artisan aioli, local greens and a Kosher pickle. Local cheese platters, organic side salads, and chili will also be available for purchase from Nature's Touch. Join us on the patio in sunny weather, or sit at the bar and enjoy our tasty, nutritious little burgers. The Rangeland tasting room is open Thursday through Saturday, 11-5 at 225 S. Main St, Templeton. We are serving sliders on Saturdays only for now (12 to 3pm), but the other grab and go food items should be available every day at Nature's Touch. We look forward to seeing you soon! Wine Specials: including our friend "Pete Sirah"
3 bottles 2014 Petite Sirah for $120, more than 10% off before your wine or meat club discount); order here. 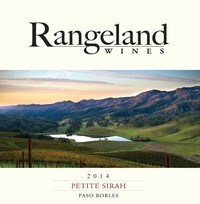 Case (12 bottles) of 2014 Petite Sirah, 20% off or $36 per bottle, before club discount; order here. Cabernet Sauvignon is the heart of what we do here at Rangeland, comprising 20 of our 40 planted vineyard acres. We've had some "wow" moments lately featuring our Cabernet and Watershed with holiday meals or sipping in front of the winter fire. Our Bordeaux special includes the 2014 Cabernet Sauvignon, which is a nicely fruit forward but still balanced rendition. This 3 bottle selection also includes the 2013 Watershed (Cab, Cab Franc, Merlot and Petite Verdot) and 2013 Limestone Reserve Cabernet, for $110--that's a savings of $20 before your club discount! Order here. After a record dry December that reduced our pastures to a crusty gray, January has started in a much more promising and seasonally wet vein. Three inches of rain in the last week has soaked the ground with almost no runoff due to the sere, absorbant conditions. While the vineyard sleeps. leafless for the winter, we have some new baby lambs kicking and many cows looking very heavy in calf. Let the storm door swing wide open and keep this winter rolling, so all these plants, animals and caretakers can thrive in the coming year.